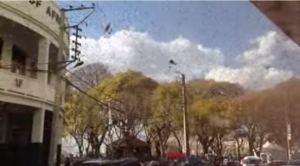 ANTANANARIVO, Madagascar — A swarm of locusts estimated at being in the millions invaded Madagascar’s capital on Thursday, a sight that one missionary described as being reminiscent of the plagues of Egypt. The skies were overtaken with the insects this week, slowing down traffic in the African nation. The invasion was captured on camera, showing the winged creatures covering the city like a cloud. “It reminds us of the 10 plagues of Egypt,” missionary Ronald Miller told ABC News. In Exodus 10, the Bible speaks of the plague of locusts that overtook Egypt and destroyed the nation’s crops because of the hardness of Pharoah’s heart in retaining the people of Israel as slaves. According to reports, the locust invasion in Madagascar has been ongoing since 2012, leading to a national disaster declaration, which is expected to cost the government $41 million to control. The infestation is said to be caused by high temperatures, calling the insects out into the city streets and not just in the rural areas where they have been most prominent. Food and Agriculture Organization (FAO) representative Patrice Talla Takoukam is working with the United Nations to help control the pest population. The locust invasion is stated to threaten the livelihoods over 13 million people, 9 million of whom make their living from farming. “Locust infestations, if untreated, could wipe out food crops and livestock grazing lands, and with it a family’s ability to provide for itself,” FAO stated. Approximately a million locusts swarmed Israel last year right before Passover, crossing from Egypt into the country. “Three thousand years ago God sent the Egyptians a plague of locusts; now we are getting them back….” resident farmer Eli Hanev told NBC News. The Bible also references locusts in the book of Revelation surrounding the fifth trumpet of judgment unleashed upon the Earth.